Posted by Toby Van de Velde on September 12, 2018. I was out cruising recently, just looking to see if I could find a shot. It was dusk, the last part of the day with any light in the sky. Known as The Blue Hour. Sometimes I go out with a camera pro-actively looking to get a picture, this was one of those occasions. 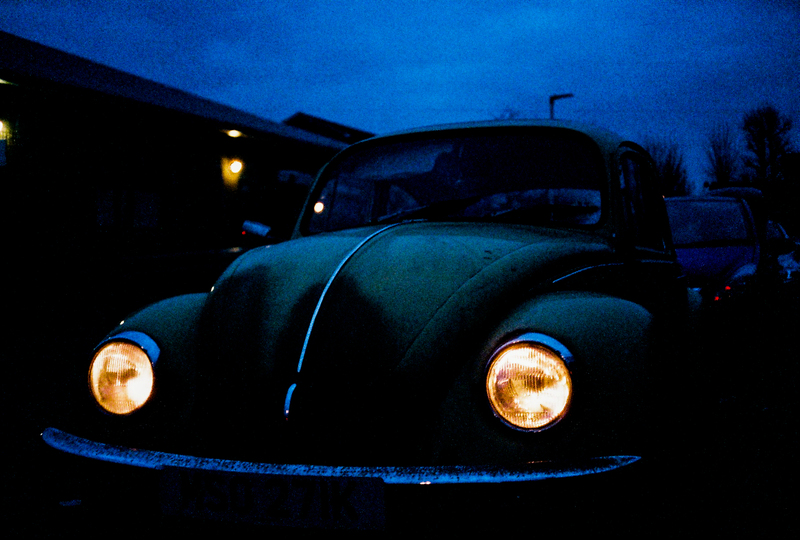 I was carrying my Olympus 35RC with a roll of FujiColour Superia 1600, a high ISO film perfect for low light levels. I came across this Volkswagen Beetle parked at the side of the road. It was just sitting there, with it’s lights on. I tried asking around but nobody knew who it belonged to. I got the shot, blue sky and burning yellow headlamps, and moved on. I never did find out who owned it. I hope the battery wasn’t flat when they returned to carry on with their journey.